After all the decayed material is removed from the tooth cavity, the tooth requires a dental restoration to return to function and aesthetic condition. Restorative materials include dental amalgam, composite resin, porcelain, and gold. Composite resin and porcelain can be made to match the color of a patient's natural teeth and are thus used more frequently when aesthetics are a concern. Composite restorations are not as strong as dental amalgam and gold ; some dentists consider the latter as the only advisable restoration for posterior areas where chewing forces are great. Some of the materials can be placed by the dentist in a clinical setting (direct technique) while others require the participation of the dental laboratory (indirect technique). The direct restorations include composite and amalgam fillings. These are placed by the dentist in a clinical setting. 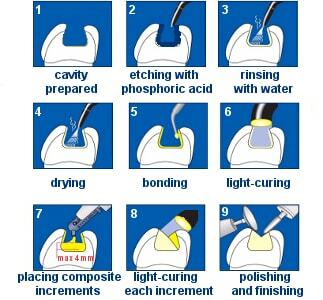 Dental composite restorations chemically bond to tooth structure. This strengthens the tooth's structure and restores its original physical integrity. The placement of composite requires meticulous attention. 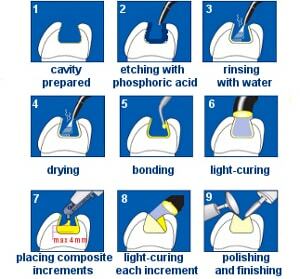 The tooth must be kept perfectly dry during placement or the resin will likely fail to adhere to the tooth. Composites are placed while still in a soft, dough-like state, but when exposed to light of a certain blue wavelength, they polymerize and harden into the solid filling. This process is called light-curing. The dentist should place composite in a deep filling in numerous increments, curing each 2-3 mm section fully before adding the next. Each increment is cured with a hand held curing light that initiates the polymerization process. In addition, the clinician must be careful to adjust the bite of the composite filling ; if the filling is too high, even by a subtle amount, that could lead to chewing sensitivity on the tooth. A properly placed composite is comfortable, aesthetically pleasing, strong and durable, and could last 10 years or more. 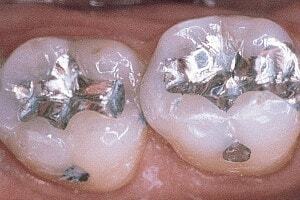 Amalgam is an alloy of mercury with various metals (silver, tin, copper). 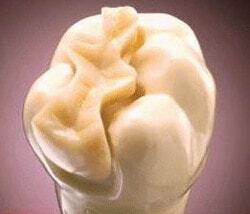 In the past, many dentists believed that amalgam is the best solution for restoring back teeth. Recently however, its popularity has diminished somewhat. Concern for aesthetics, environmental pollution, health, and the availability of improved, reliable, composite materials have all contributed. Indirect restorations are manufactured at the dental lab after an impression of the prepared cavity is made at the dental office. These restorations are also known as inlays. An inlay is an indirect restoration consisting of a solid substance (as gold, porcelain or less often a cured composite resin) fitted to a cavity in a tooth and cemented into place. Generally, an inlay is indicated when the decay or fracture is so extensive that a direct restoration, such as amalgam or composite, would compromise the structural integrity of the restored tooth or provide inferior resistance to chewing forces. 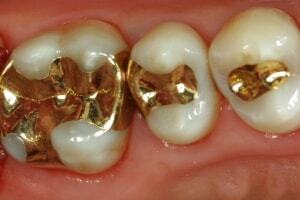 Inlays can be made of gold, porcelain or composite resins. Gold inlays are superior in terms of resistance to occlusal forces, protection against recurrent decay and precision of fabrication. Porcelain inlays are highly aesthetic. 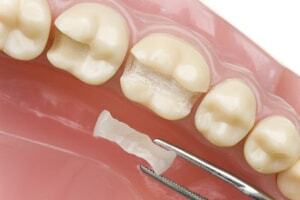 However, inlays are much more expensive than direct restorations and take a longer time to be completed. Sometimes, choosing between an inlay and a dental filling can be a challenging process (...more details). When the decay is too extensive, there may not be enough tooth structure remaining to allow a restorative material to be placed within the tooth. In these situations, a dental crown is indicated. An extraction can also serve as treatment for dental caries. The removal of the decayed tooth is performed if the tooth is too far destroyed from the decay process to effectively restore the tooth. Extractions are sometimes considered if the tooth lacks an opposing tooth or will probably cause further problems in the future, as may be the case for wisdom teeth. Extractions may also be preferred by patients unable or unwilling to undergo the expense or difficulties in restoring the tooth.